1. A fully grown adult male gorilla can stand more than 6 feet tall and it can weigh between 300 and 500 pounds. This makes the gorilla the largest living primate (which includes humans, apes, and monkeys) in the world. Adult female gorillas are only about half the size of the male gorillas. 2. 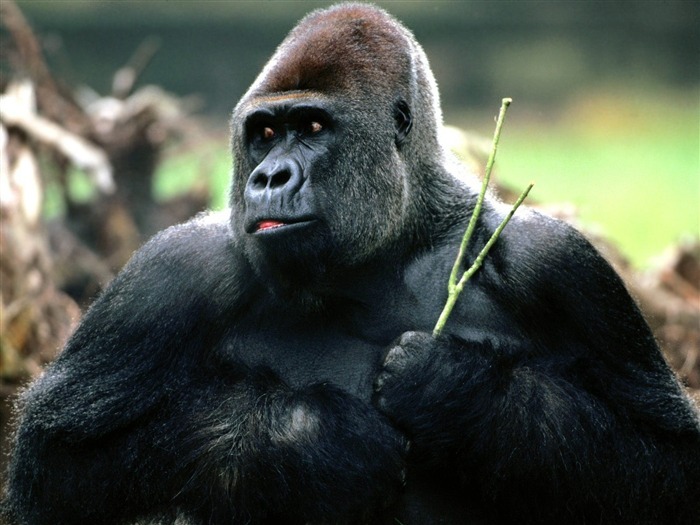 Gorillas are mainly herbivores, meaning they eat plants and vegetation. Since this type of diet does not provide much nutrition, a gorilla often eats up to 40 pounds of food every day. 3. A gorilla’s strength is about 6 times that of a human’s strength. 4. Gorillas can walk upright on two legs, but they usually walk on all four of their limbs instead. 5. Researchers have identified more than 20 sounds that gorillas use to communicate with each other. 6. A gorilla’s day is split up into three activities – eating, sleeping, and foraging for food. They usually spend about a third of their day on each of those activities. 7. Gorillas enjoy spending time with family groups, which are called troops. These troops often include an adult male gorilla, a few female gorillas, a young male gorilla, and several offspring that are younger than 8 years old. 8. Once a female gorilla reaches the age of 8, she is ready to leave the troop so she can reproduce with another non-related gorilla. 9. The main predators of gorillas include crocodiles and leopards. 10. The majority of gorillas live in the African tropical forests, including the Congo, Rwanda, Uganda, Nigeria and Cameroon. 11. The species known as the Cross River gorillas is nearly extinct. It has fewer than 300 of the species living in the wild right now. Several African nations have put laws into place to prevent the further depopulation of gorillas. 12. The main reason for the depopulation of gorillas is humans. Deforestation and loss of habitat along with poaching, transmitted diseases from humans, and wars have contributed to the shrinking number of gorillas on the African continent. 13. After the bonobo and chimpanzee, the gorilla is the next closest living primate to humans. We share about 98% of our DNA with the gorilla. 14. The mating season for the gorilla lasts throughout the year. A female gorilla’s gestation period is about 8.5 months, very similar to that of a human. They also have one offspring at a time. 15. Infant gorillas only weight between 3 and 4 pounds when they are born. They start crawling at about 2 months old and they begin to walk around 8 to 9 months of age. The mother nurses their young one for about 3 years before it becomes independent. 16. Gorillas can wander around for about 10 to 15 miles each day as they forage for food and play with other gorillas in their troop. 17. Female gorillas are mature enough to mate and reproduce at 10 years old. Male gorillas are not ready to mate until they are about 13 years old. 18. Gorillas are split into three basic groups – the Western Lowland, the Eastern Lowland, and the Mountain gorillas. 19. Generally, gorillas are rather shy and non-aggressive. However, they can get aggressive if they feel threatened or if they feel that their offspring is being threatened or harmed. In most cases, though, they simply make a long of noise rather than confront other animals. 20. A gorilla’s arms are longer than its legs. 21. In the wild, gorillas can live as long as 35 years. When they are in captivity, they have been known to live as long as 50 years. 22. A silverback gorilla is an adult gorilla that is over the age of 12. They have the name of “silverback” because the hair on their backs, which is usually black, begins to turn gray. 23. Gorillas enjoy grooming each other, except for silverback gorillas. Female gorillas will groom each other, their offspring, and silverbacks. But silverbacks do not groom other gorillas. 24. Gorillas experience a wide variety of emotions, including joy, greed, love, fear, hate, jealousy, and empathy. When they cry out of sadness, they use sounds as they cry. They also laugh when they are tickled. 25. Gorillas can understand spoken language, though they cannot speak it. They have been known, however, to learn sign language to effectively communicate with humans.